Yusra had her first lollipop this Ramadan – and of course she loved it. I hadn’t realised but up until then I hadn’t actually given her any even though on so many occasions she’s been given them by others (Restaurants, doctors surgery etc.) – I kind of feel like I’ve deprived her. She’s been talking about them a lot and is fascinated that they come in all colours. Anyways, so I thought why not include some lollipops in our lives this Eid and why not do it with a lovely, little touch. 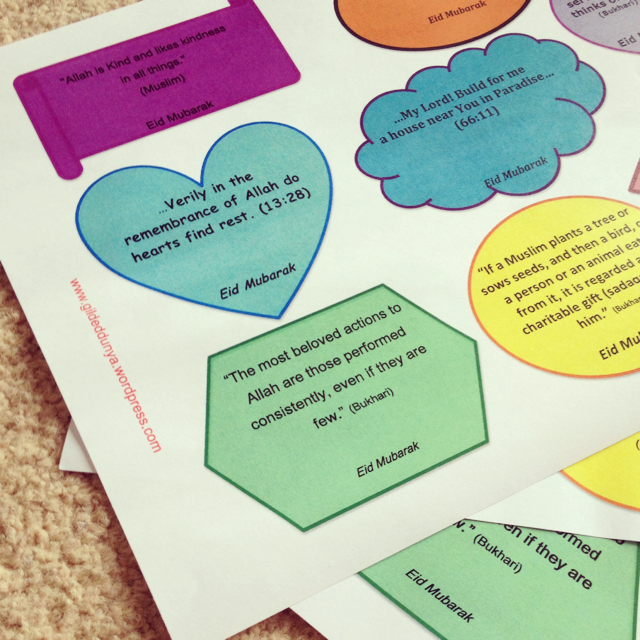 I’ve found some hadiths and Quranic ayahs (that I love) and then made little Eid Mubarak tags/posts with them. There are 16 different ones and they come in different colours and shapes. 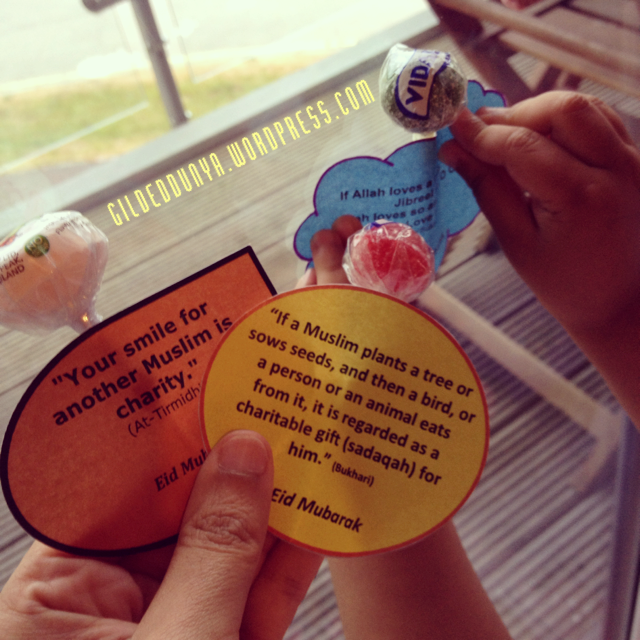 Yesterday, Yusra and I stuck these little posts onto a lollipop each. It was hard work as she wasn’t sure why she couldn’t have any – but I enjoyed it very much as I spoke to her about what some of them say. She obviously understood zilch about anything I had said, but it was lovely talking to her about Allah and the Prophet and she was repeating some of the words I was saying. I’ll be taking some of these with me to Eid salah for other children and some to my in-laws on Eid day as we spend our Eids there – inshaAllah they can be given out to the guests. I’ve also put one each into Yusra’s cousins Eid goodie bags. 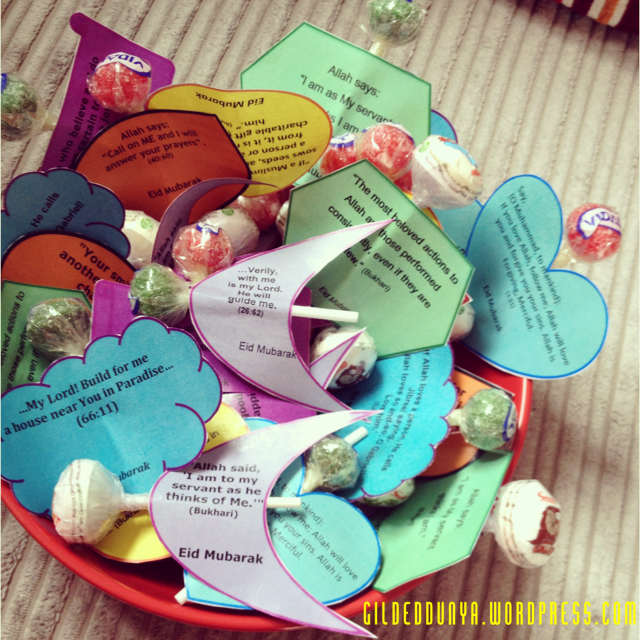 These lollipops with tiny little Eid Mubarak messages can be personalised, made bigger, have your own choice of quotes etc – and can be given out to neighbours, at school or to the guests that come to visit you on Eid inshaAllah. They don’t even have to be stuck onto lollipops; you can add them to anything you like. Here’s the template: lollipopsOnePage for the little tags and the quotes I’ve picked. You can print them in colour to make them look nice and bright. Just cut around the different shapes and stick onto a lolly stick with a tiny bit of tape. 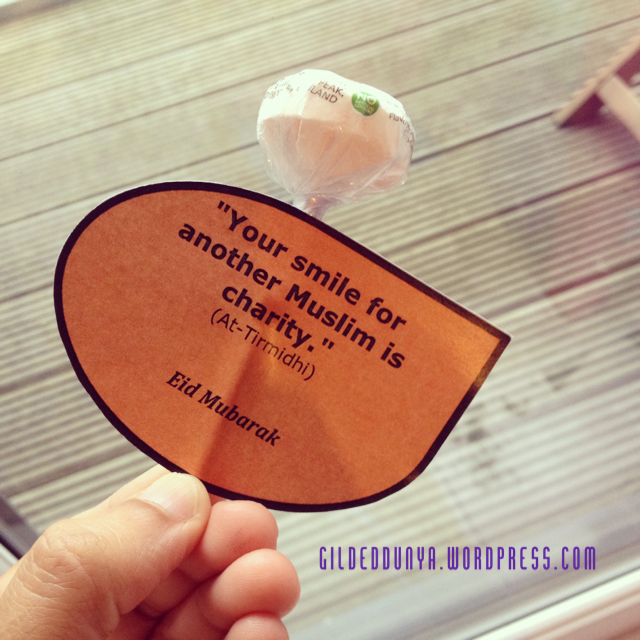 It’s a very small way of spreading a little Eid love! InshaAllah we see the end of Ramadan with a changed and more devoted heart and I pray we are all able to maximise our rewards in these last nights. Ameen. Lastly, from Yusra and I, lots of love and duas for Eid – Eid Mubarak! This is adorable mashaAllah and a really great idea!